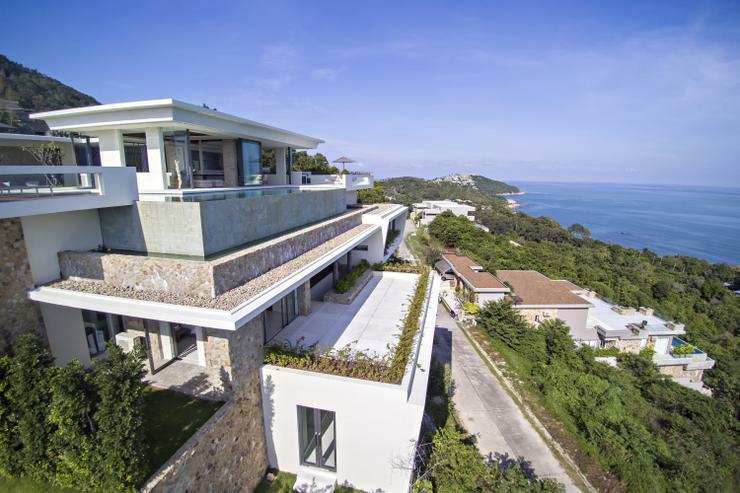 Villa Natha enjoys a scenic, private hillside location and is a short distance from Chaweng beach with its wide range of shopping, dining and entertainment options. Although not directly located on the beach, the property offers breathtaking 180 degree views of Koh Samui’s tropical coastline and the crystalline waters of the Gulf of Siam beyond. Villa Natha is constructed over 3 levels to provide all modern comfort, space and stunning views of the ocean and the Gulf of Siam. Each level has its own private garden area and is connected to the next floor by an enclosed inner stairway. 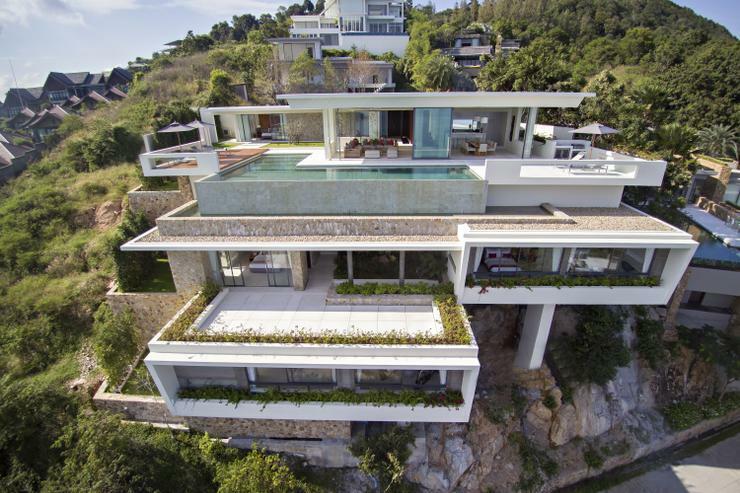 The villa is designed to offer a seamless combination of relaxed indoor and outdoor living, with wide terraces for lounging, a fully equipped private gym, a fabulous private cinema with comfortable seating, and an infinity pool that seems to flow right into the ocean. The property is fully protected by a 24-hour security service and comes with its own private parking spaces for guests. All the five bedrooms (3 King and 2 Queen) of villa Natha are elegantly and comfortably furnished, with all of them offering astounding ocean views right from the bed. Spread across all three levels of the villa, the bedrooms feature TVs, built-in wardrobes spread over three floors, ensuite bathrooms with a full range of private amenities. The bedroom on the upper floor opens directly onto the inviting infinity pool and a furnished stone and wooden sun terrace. The interiors blend natural textures and gentle Asian touches with to provide a complete tropical island experience. The upper lounge of villa Natha houses an oversized double sofa suite and an airy dining space to seat 10 guests. The living area opens directly onto the sun terrace while the dining room extends onto a separate terrace with a built-in barbecue unit for alfresco meals. The dining room also features a breakfast bar and stools, and is served by a fitted western style kitchen. The middle floor houses a second living area and media rook with ultra-comfortable sofa facing a large flat screen TV. Outdoors, the ocean view infinity pool is perfect for a cool dip while the spacious terraces and built-in barbecue allow guests to enjoy Koh Samui’s climate and tropical environment. Wooden sundeck and loungers are ideal for lazy days in the sun. * All basic laundry is done for guests on a complimentary basis. Bed linen is changed every third day and towels are changed as necessary. * Extra bed will be charged at US$50++ per night. * On site Thai Chef (Thai cuisine and Western favourites) with shopping list available. Food cost on Guests’ account (Terms & Conditions may apply for chef service). * For weddings and private parties, a surcharge may be applicable depending on number of guest. Also the villa booking conditions may change such as the required minimum nights stay. Separate Terms and Conditions may apply for any wedding or private parties held in a villa and will be confirmed at the time of your booking. Special note: This page was about Villa Natha - Chaweng beach, Koh Samui. All of our websites involve Holiday rentals in Asia. So please browse our holiday villa websites for more great deals and special offers.